The history of the railways of the Isle of Wight is both long and fascinating. The passenger stock holds particular attractions simply because of its varied origins. Brought together in one volume is the story of the steam-hauled stock used by the island’s companies, Southern Railway and British Railways. 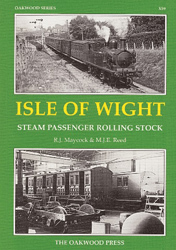 The book concludes with a brief look at vehicles that have survived into preservation on the Isle of Wight Steam Railway. Authors’ profits from this book will go towards further restoration and maintenance of passenger rolling stock for the Isle of Wight Steam Railway. A5 format, more than 130 illustrations.